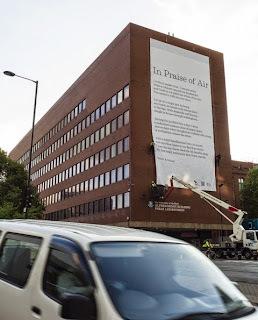 The University of Sheffield in England is proudly displaying a 65' billboard on the side of one of its buildings featuring a beautiful poem by Simon Armitage called "In Praise of Air". The poem, which celebrates the wonderfulness of fresh air, is appropriately printed on a titanium dioxide material that literally EATS smog in the air... which at that size means the pollution from 20 cars per day! Excuse me while I get all John Lennon on you, but imagine how beautifully pure our air would be if every billboard were made of this?